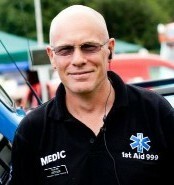 I am an Event Emergency First Aid Service & Security Service based in Nottingham. My work is varied from Event First Aid & Medical Cover to Urgent Organ & Blood Transfers and Static and Mobile Security. I carry out work throughout the UK and can be in different parts of the country day to day and even occasionally abroad. Although I can carry out any event work I now specialise, following demand, in providing single or small teams first aid cover, with a fully equipped Vehicle if needed, including a 4×4, for Events, Extreme Sports, Company Fun Days, Night Clubs as well as Business, Tactical & Military Security work. I am all qualified and experienced at first aid cover for event’s, of which I am always adding to through additional training with various sources including the NHS.